Acts 5:34-42 Gamaliel to Sanhedrin: “Be careful. If their endeavor is of human origin, it'll destroy itself, but if it's from God, you won't be able to destroy them.” He persuaded them. They flogged the Apostles, ordered them to stop speaking in Jesus' name, and dismissed them. The Apostles left, rejoicing that they suffered for the sake of the name. They kept teaching and proclaiming Jesus. Ps 27:1, 4, 13-14 "One thing I seek: to dwell in the house of the Lord." The Lord is my light and my salvation; whom should I fear? 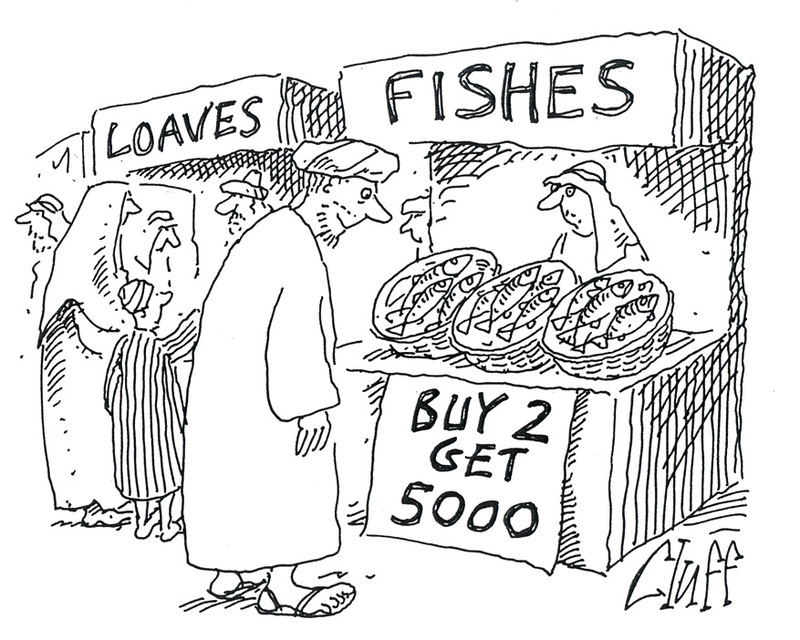 Jn 6:1-15 Jesus, seeing a crowd coming to him, asked, “Where can we buy food for them?” / “A boy has five loaves and two fish, but what good are those?” / “Have them recline.” They did. 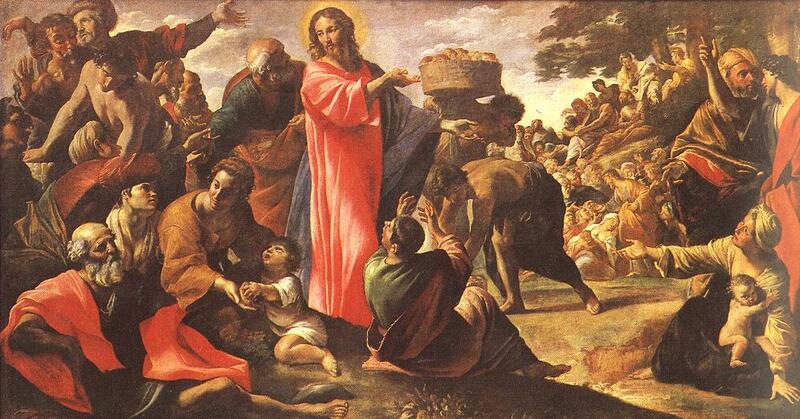 Jesus distributed the loaves. They had their fill, filled twelve baskets of leftovers, and said, “This is the Prophet.” Since Jesus knew they were going to make him king, he withdrew. Homily: (1) Jesus loves people and attends to their problems: he speaks, preaches, and accompanies people. He speaks with authority, with the power of love. (2) The religious authorities are hypocritical and jealous; they can't tolerate Jesus' meekness and love and that people followed him. They know who Jesus was but paid to silence the truth. (3) The apostles show the joy of witness: The "thought police" had the apostles flogged. There are still such people who persecute and kill, and many who rejoice to suffer in Christ’s name; people go to jail for carrying a Gospel or are fined for wearing a crucifix. Creighton: Do I give thanks for the miracles in my life? One Bread One Body: The early Church with its revolutionary message had its enemies. The Church still has enemies but will triumph. DailyScripture.net: The feeding of the multitude recalled the manna in the wilderness under Moses and foreshadowed Jesus, Bread of Heaven, satisfying our deepest hunger. When we receive the Eucharist, we're united with Christ and receive healing and strength. God gives abundantly so we may share with those who lack. God multiplies for others' good the little we have. Passionist: The first Christian communities were formed from the preaching of those witnessing to the Resurrection. Waste, from gospel's "so that nothing will be wasted," connotes destruction or perishing. In the Eucharist see that all are nourished, care for those with special needs, and don't overlook anyone, lest they perish. Moved to greater love and rejoicing at imitating Jesus in life's sufferings: Re 1st reading flogging: "Pleasure is shallow, but joy has pain in the middle of it. Pleasure comes and goes, but joy has eternity in it." (Redeemed/ King) Talk with Jesus about a personal experience of pain; ask to see the graces available in the midst of it. Universalis: St. Athanasius, bishop, fought against Arianism (that the Son was created by the Father and not equal to him, leaving an infinite gap between God and people).